EXMO Cryptocurrency Exchange speaks at the international forum Blockchain Life Asia 2019 that takes part on April 23-24, 2019 in Singapore. The conference will gather crypto market influencers who will explain to the participants how to make money with cryptocurrencies and blockchain technology. 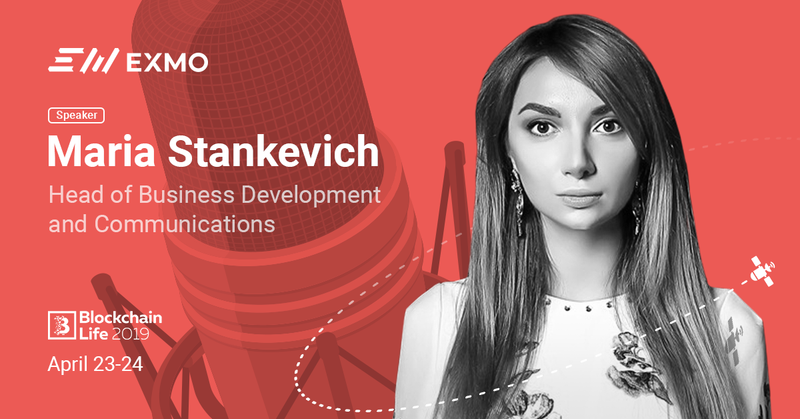 Head of Business Development and Communications of EXMO Maria Stankevich will speak in the crypto exchange panel discussion «Best world exchanges. Market forecasts and insights» and share market predictions for 2019. The EXMO Team will be happy to answer all of your questions at EXMO booth at the exhibition. Please, do not hesitate to come and talk about trading or anything else with us. Our booth number is P13. The further details and tickets one can find using the following link.